Busy on Walk Day? Become a Virtual Walker, and stay involved in the Boston Marathon® Jimmy Fund Walk presented by Hyundai. Virtual Walkers are fundraisers who cannot attend Walk Day, and still want to fundraise for Dana-Farber and the Jimmy Fund. Many Virtual Walkers choose to host their own walks with family and friends. Virtual Walkers 13 or older on Walk Day have a fundraising minimum of $100, which includes the $5 registration fee. Those 12 or younger on Walk day have a fundraising minimum of $25, which includes the $5 registration fee. All Virtual Walkers who reach their minimum will receive a Jimmy Fund hat in the mail. 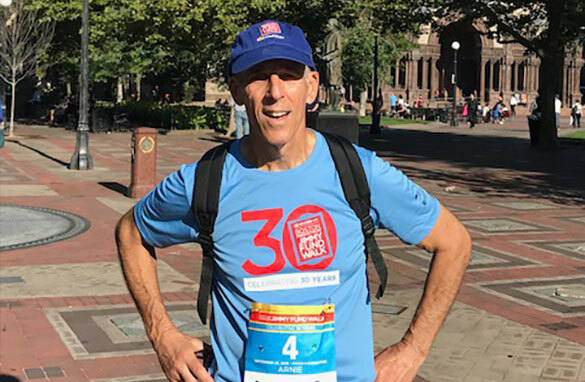 Virtual Walkers who raise $325 or more (or $125 or more if you are 12 or younger) will receive a Jimmy Fund Walk T-shirt and medal in the mail. Arnie is an employee and a team member of Team Neuro. Arnie walks in support of his patients. Since he was unable to participate on Walk day in 2018, he decided to Virtually Walk.